Instructions: Cut a piece of white cardstock to 8 1/2 x 5 1/2" size, score and fold at 4 1/4" to create the card base. Cut the card front shown from the Tulip paper. Use from the 2nd largest die from the HCD2-751 Cut Mat Create 2A Die to diecut the center panel from the card front. Lay the card front border onto center of card base as a template, then place the Cut Mat die onto front fold of card and diecut opening. Stamp the Happy Anniversary from the HCPC-3847 Celebrate Love Sentiments Cling Stamp Set onto the center panel. Using from the HCD1-7161 Sweetheart Borders Die, diecut the long border from white cardstock. Trim the border to a 3 1/2" length and attach onto the top backside of card front border. Now attach the center panel through opening onto inside of card. Use double dots to attach the card front border to the card base as pictured. Stamp medium tulip 1x from HCPC-3858 Tulip Time Cling Stamp Set in Vibrant Fuchsia ink onto white cardstock and diecut with coordinating die. Stamp the small tulip from same stamp set in Tiger Lily ink onto white cardstock and diecut with coordinating die. Stamp small tulip leaves 3x from same stamp set in Fern Green onto white cardstock and diecut with coordinating die. Stamp the tulip border from HCPC-3861 Tulip Cart & Fence Cling Stamp Set in two color tones, Fern Green (leaves) and Vibrant Fuchsia (tulips) onto white cardstock and diecut with coordinating die. 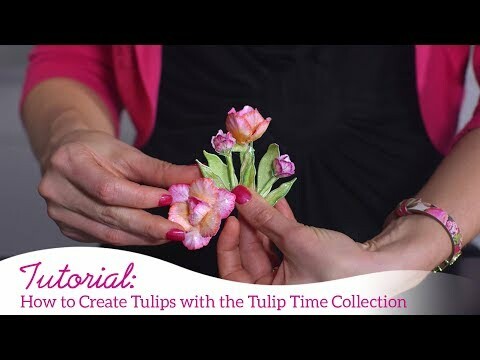 Use the Stack and Store daubers to color the tulips and leaves. For the tulips petals, use Magenta Hue on the outer edges of petals and Tiger Lily in the centers. Use a variation of the same two colors for the tulips of border. For the leaves use Leaf Green ink. Use the HCFB1-472 3D Tulip Shaping Mold to shape tulip petals. Spritz the petals lightly with water before sending the the diecutting machine. Use the shaping stylus to finish shaping the leaves and tulip border. Use hot glue gun to assemble tulips and thread wire stamen from HCS1-458-3 Bright Bead Stamens-Medium through the tulip centers. Thread the tulip stamens through the top of leaf stems and attach with hot glue. Attach all 3 tulips to the inside of card as shown. Attach the tulip border to the outside of card panel. Use Dries Clear glue along with Crystal glitter to add a touch of sparkle over card as desired.